The Environment Agency is urging people and businesses in Devon and Cornwall to be ‘#floodaware’, during its annual Flood Action campaign. People can find practical advice on GOV.UK about what to do to reduce the risk to their personal safety and property when they receive a flood warning. This includes moving treasured possessions upstairs and keeping important documents to hand. Having had the misfortune to experience flooding first-hand and knowing the devastation that this can cause, I am keen to raise awareness of the Flood Action campaign. I recently signed up to the Environment Agency’s free flood warning service and I would strongly encourage others to do the same. The winter of 2013 to 2014 was the wettest in England for nearly 250 years but some 1.4 million properties were protected by Environment Agency flood defences. Further investment means that flood schemes have protected an extra 177,000 properties in the last 4 years. One in 6 properties in England is at risk of flooding. Many people think that flooding will never happen to them - but it could. The Environment Agency is also encouraging people to alert friends and family on social media using the hashtag #floodaware. Visit Twitter and Facebook to get involved. Media enquiries: email Communications_DC@environment-agency.gov.uk or call 03708 506 506. The Flood Action campaign runs for 2 weeks until 13 November and will involve a range of media and social media activity, alongside partnership work and community engagement. 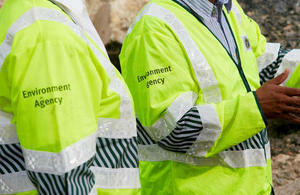 Keep an eye on our latest activity on our blog, Creating a better place and Twitter @EnvAgencySW.